The Sacrament of Baptism is one of two sacraments celebrated by Protestant Christians. Just as we recognize one body of Christ encompassing all believers, we accept and adhere to one Baptism, no matter which Christian church – Roman Catholic, Greek Orthodox, Latter Day Saints, Baptist, Nazarene, non-denominational, whatever – administered it. A person receives baptism only once. When an infant or child is baptized, their baptism witnesses to the truth that God’s love claims people before they are even able to respond in faith. 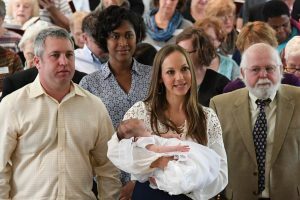 Baptisms of both infants and adults are celebrated in a service of public worship. If you or your child have not been baptized and you wish to arrange a baptism, contact Rev. John Lentz or the church office (216-321-2660) to arrange an appointment with either pastor.